The goal of this page is to document the various changes that have occurred through the release of a certain water gun. These changes are knowns as makes, versions, variants--and more commonly--marks. I have tried hard to make this page as detailed as possible: If you have any additional information or pictures that you would like to share to improve this guide, don't hesistate to submit them; your help is appreciated. 1 1993 Original Equal Pink body; yellow reservoir; annular trigger guard. 2 1993 Original Equal Yellow body; blue reservoir; annular trigger guard. 3 1993 Original Equal Purple body; yellow reservoir; more rectangular trigger guard. 4 1993 Original Equal Light green body; purple reservoir; annular trigger guard. 1 1991 Original Pump in body oriented backwards; yellow body; red reservoir, nozzle, pump. 2 1992 Classic Pump in grip; red body; yellow reservoir, nozzle, pump; pink and blue logo; marked "Made in China." 3 1992 Classic Pump in grip; red body; yellow reservoir, nozzle, pump; yellow and blue logo; marked "Made in Macau." 1 1993 Original Equal Green body; yellow reservoir; red nozzle and pump. 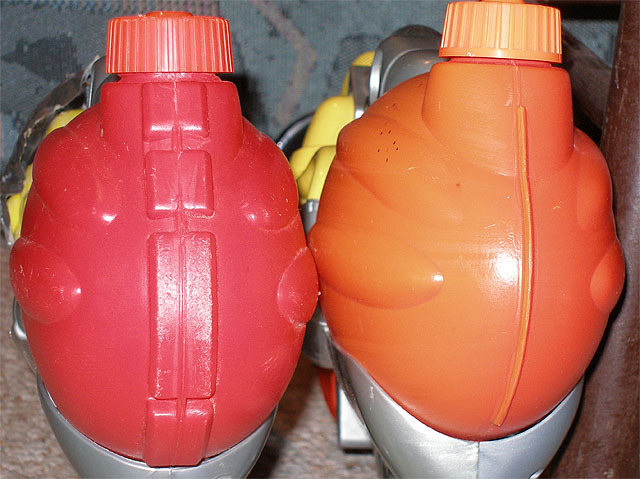 2 1993 Power Rangers Equal Varying colors; marked "Super Soaker PR 100." 1 1990 Original Equal Orange body; yellow reservoir; wire-like trigger. 2 1998 New and Improved Equal Blue body; yellow reservoir; full-pate trigger. 3 1999 New and Improved Equal Purple body; yellow reservoir. 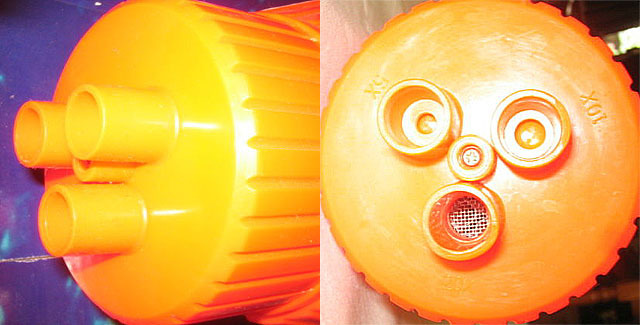 4 European Equal Orange body; yellow reservoir; marked "Super Soaker 50" and "Ideal." 1 1988 Power Drencher Equal Marked "Power Drencher." 2 1989 Original Equal Yellow body; light green reservoir; wire-like trigger. 3 1990 Original Equal Yellow body; light green reservoir; full-plate trigger. 4 1998 Classic Equal Yellow body; light green reservoir; marked "Classic Series." 5 1999 10th Anniversary Equal Silver body; light green reservoir. 6 Camouflage Equal Green camouflage body. 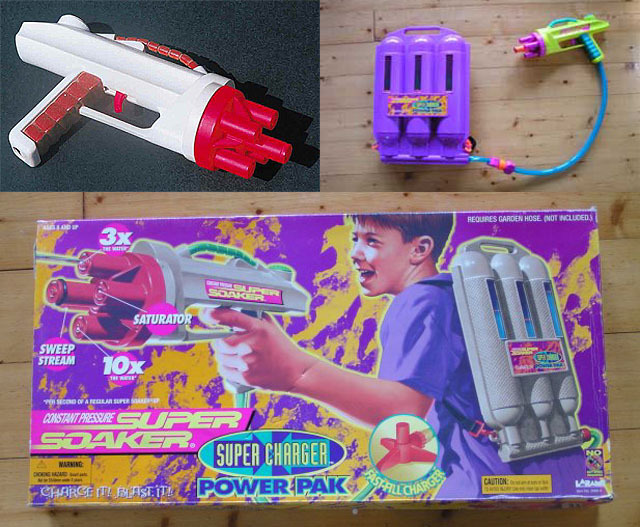 7 European Equal Yellow body; light green reservoir; wire-like trigger; marked "Super Soaker 100" and "Ideal." 1 1993 Original Equal Red reservoir, chamber, nozzle; yellow body; blue pump. 2 1993 Original Equal Purple reservoir and chamber; green body; orange nozzle and pump. 3 Equal White reservoir; red pump, chamber, nozzle; silver body. 1 1990 Original Equal Blue body; yellow reservoir and chamber. 2 1992 Classic Equal Blue body; yellow reservoir and chamber. 3 1997 New and Improved Equal Orange body; green reservoir and chamber. 4 Equal Blue body; orange reservoir and chamber. 1 1991 Original Equal Red body; yellow grip and chamber; green reservoirs. 2 1991 European Equal Red body; yellow grip and chamber; green reservoirs; marked "SS 2000" and "Ideal." 1 1993 Original Equal Purple and blue body; yellow chambers. 2 1994 XP 300 Equal Extremely rare; grey and red body; yellow chambers. 3 1993 European Equal Purple and blue body; yellow chambers; marked "SS 3000." 1 1993 Original Equal Yellow body; red reservoir. chamber, nozzle; blue pump, handle, trigger. 1 2001 Wipeout Early edition; marked either "CPS Wipeout" or "Super Soaker Wipeout." 2 2001 Marked "CPS 1-3-5." 1 1998 Original Superior Nozzle piece can be screwed off; easiest to modify. 2 1998 Rerelease Inferior Later 1998 release; nozzle piece can be screwed off; trigger harder to pull; hard to modify. 3 Rerelease Superior Nozzle glued in place; hardest to modify. 4 Super Shooter 2000 Superior The only fake that is good. Left, CPS 1000 prototype; right, mass-market release. 1 2000 Original Superior Yellow body; nozzle cover lighter in color than mark 2; nozzle cover not glued on; relief valve opens at relatively high pressures. 2 2000 Original Inferior Yellow body; nozzle cover darker in color than mark 1; nozzle cover glued on; relief valve opens at relatively low pressures. 3 2001 Rerelease Superior Silver body; two notches on trigger; trigger thicker than 4 mm (5/32 in). 4 2001 Rerelease Inferior Silver body; one notch on trigger; trigger thinner than 4 mm (5/32 in). Left, CPS 1200 mark 1 or 2; right, CPS 1200 mark 3 or 4. 3 Superior Orange pump cap cannot screw off. 4 Far Superior Stickers on opposite side; valve does not allow air shots. 0 Prototype Unreleased; pipe for a nozzle. 1 1996 Original Superior Shorter, more expansive bladder; longer pressure gauge; may be it as "Air Pressure." 2 1997 Rerelease Inferior Longer, less expansive bladder; shorter pressure gauge. 3 Possibly European Appears to be a variant of the 1997 edition; marked "Air Pressure Super Liquidator." Top, CPS 2000 mark 1; bottom, CPS 2000 mark 2. 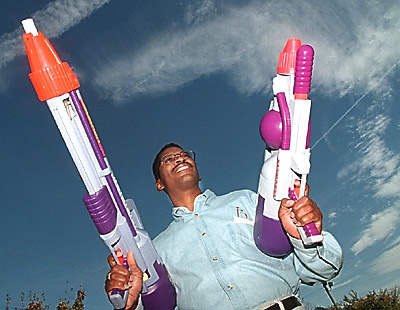 Left, CPS 2000 prototype; center, Lonnie Johnson, inventor of the Super Soaker; right, CPS 1000 prototype. 1 2002 Original Superior Pump cap not glued on; seam at end of reservoir; smaller ridges on reservoir cap. 2 Far Inferior Fake nozzle head; pump cap glued on; seam at end of reservoir; extremely hard to open; smaller ridges on reservoir cap. 3 Inferior Ridges at end of reservoir; pump cap not glued on; pressure chamber is larger; center part of nozzle attached to internals and casing; easiest to modify; larger ridges on reservoir cap. 4 Mixed attributes of the above marks. Left, the ridges, indicative of a mark 3; right, the seam, indicative of a mark 1 or 2. Left, larger ridges, indicative of a mark 3; right, smaller ridges, indicative of a mark 1 or 2. 1 1998 Original Equal No labels on nozzles. 2 1999 Rerelease Equal Labels on nozzles. 3 Equal Purple reservoir cap; logo on opposite side; lighter color tank. Left, mark 1, no labels; right, mark 2, labels. Images provided by Aqua Flash. 1 2000 Original Equal Orange body. 2 2001 Rerelease Equal Silver body. 3 2001 Rerelease Equal Silver body; nozzle cover smaller; represented by a single soaker. Left, CPS 2700 mark 1; right, CPS 2700 mark 2 or 3. 1 2002 Original Superior Purple reservoir cap tether; number on logo; seam at end of reservoir. 2 2003 Rerelease Inferior Prone to trigger breaks; trigger harder to pull; orange reservoir cap tether; no number on logo; ridges at end of reservoir. 1 1998 Original Equal Green body with purple detailing; yellow reservoir; red pump coming out the handle; red trigger and nozzle; no trigger guard. 2 Improved Equal Purple body; yellow reservoir; red pump coming out the handle; red trigger and nozzle; blue, annular trigger guard. 3 2000 Rerelease Equal Purple body; green, transparent reservoir; yellow pump coming out the front; orange nozzle, trigger, reservoir cap; no trigger guard. 1 1998 Original Equal Red body; yellow reservoir; blue pump. 2 2002 Double Action Pack Equal Blue body; red reservoir and pump. 3 2002 Double Action Pack Equal Red body; purple reservoir and pump. 4 2004 SoakerTag Twin Pack Equal Blue body; yellow reservoir and pump. 5 2004 SoakerTag Twin Pack Equal Yellow body; blue reservoir and pump. 1 1998 Original Equal Yellow body; blue reservoir and chamber; orange nozzle, trigger, pump cap, reservoir cap; red pump. 2 Equal Blue body; green reservoir and chamber. 3 Equal Green body; blue reservoir and chamber. 4 2005 Rerelease Equal Purple body; blue reservoir and chamber; green pump and reservoir cap; orange nozzle and trigger. 1 1993 Original Equal Grey and yellow body; green reservoir; pink pump. 2 1999 Rerelease Equal Blue and grey body; red reservoir and pump. 1 1997 Original Equal Yellow body; green reservoir; black pump and detailing. 2 Rerelease Equal Orange body; transparent green reservoir; blue pump and detailing. 1 1994 Original Equal Yellow chamber; green reservoir; plain lettering on logo. 2 1999 Classic Equal Green chamber and reservoir; stylized lettering on logo. 1 1996 Original Equal Green body; purple chambers and reservoir; yellow pump; marked "Xtra Power XP 105" on body; small "Air Pressure Super Soaker" logo on reservoir. 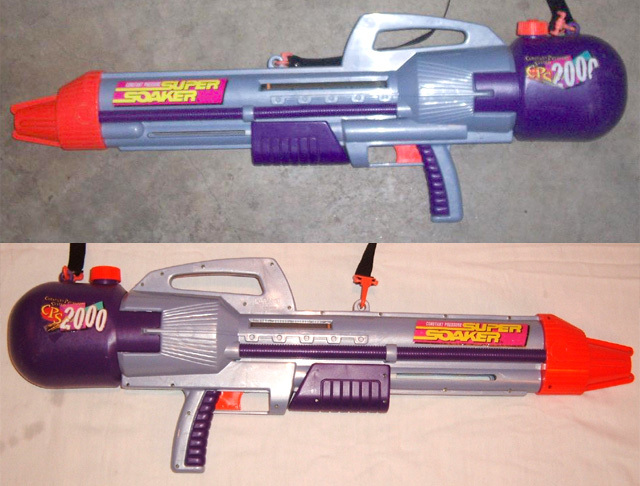 2 1997 Rerelease Equal Green body; purple chambers and reservoir; yellow pump; marked "Xtra Power XP 105" on body; large "Air Pressure Super Soaker" logo on reservoir. 3 Glow in the Dark Equal Glows in the dark; blue body; white chambers and reservoir; green pump; marked "Glow in the Dark!" on body; . 1 1993 Original Equal Riot blast; two peg reservoir connection. 2 1994 Improved Equal No riot blast; screw on reservoir. 3 1998 Classic Equal Light green, purple, and orange; no riot blast; screw on reservoir. 4 1999 Classic Equal Riot blast; screw on reservoir. 1 2001 Original Equal Blue body; yellow pump. 2 2004 SoakerTag Equal Red body; blue pump. 3 2006 Rerelease Equal Yellow body; purple reservoir; light blue pump. 4 2006 Rerelease Equal Blue body; white reservoir; red pump. 5 Max-D 3000 Twin Pack with XP215 Equal Light green body; opaque purple reservoir; blue pump. 1 2000 Original Equal Green body; yellow transparent reservoir; yellow trigger; orange pump, reservoir cap, nozzle. 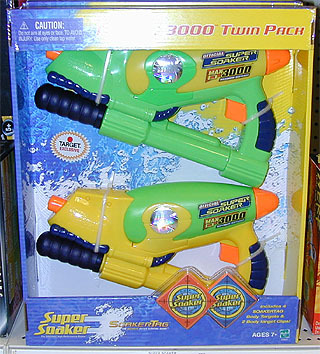 2 2002 Double Action Pack Equal Green body; yellow reservoir and trigger; orange pump, reservoir cap, nozzle. 3 2002 Double Action Pack Equal Yellow body; light blue reservoir and trigger; orange pump, reservoir cap, nozzle. 4 2004 SoakerTag Twin Pack 1 Equal Black body; red reservoir and reservoir cap; yellow pump and detailing on grip; orange trigger and nozzle. 5 2004 SoakerTag Twin Pack 1 Equal Black body; light green reservoir and reservoir cap; purple pump and detailing on grip; orange trigger and nozzle. 6 2004 SoakerTag Twin Pack 2 Equal Black body; yellow reservoir and reservoir cap; red pump and detailing on grip; orange trigger and nozzle. 7 2004 SoakerTag Twin Pack 2 Equal Black body; purple reservoir and reservoir cap; light green pump and detailing on grip; orange trigger and nozzle. 8 2005 SoakerTag Elite Twin Pack Equal Blue body and pump; light blue reservoir; reservoir cap; orange trigger and nozzle. 9 2005 SoakerTag Elite Twin Pack Equal Green body and pump; light blue reservoir; reservoir cap; orange trigger and nozzle. 1 2000 Original Equal Red body; green pump; blue, transparent reservoir; blue trigger. 2 2002 Double Action Pack Equal Red body; blue reservoir and trigger. 3 2002 Double Action Pack Equal Blue body; red reservoir and trigger. 1 2000 Original Equal Yellow body; green chamber and reservoir. 2 Rerelease Equal Grey body; blue chamber and reservoir. 3 Rerelease Equal Black body; blue chamber and reservoir. 4 Rerelease Equal Red body; blue chamber and reservoir. 1 2000 Original Equal Green body; yellow, transparent reservoir; yellow chambers; black pump; orange trigger, nozzle selector, reservoir cap. 2 Rerelease Equal Light green body; blue, transparent reservoir; blue chambers and pump; orange trigger, nozzle selector, reservoir cap. 3 Rerelease Equal Blue body; green, transparent reservoir; black pump; light green trigger, nozzle selector, reservoir cap. 1 2002 Original Equal Yellow body; green reservoir; red pump; orange trigger, nozzle, reservoir cap. 2 2003 Rerelease Equal Grey body; purple reservoir; black pump; orange trigger, nozzle, reservoir cap. 3 2004 SoakerTag Equal Blue body; yellow reservoir, trigger, nozzle; red pump. 4 2004 SoakerTag Equal Light green body; light blue reservoir; dark blue pump; orange trigger, reservoir cap, nozzle. 5 2004 Toy Story Equal Grey body; green reservoir; blue reservoir cap and pump; red trigger; orange nozzle; Buzz Lightyear sticker; marked "Buzz." 6 2005 SoakerTag Elite Twin Pack Equal Blue body; orange reservoir; light green trigger, reservoir cap, nozzle; black pump. 7 2005 SoakerTag Elite Twin Pack Equal Light green body; blue reservoir; yellow trigger, reservoir cap, nozzle; black pump. 8 2006 Rerelease Equal Blue body; red reservoir; yellow pump; orange nozzle, trigger, reservoir cap. 1 2002 Original Equal Green body; orangish red reservoir, trigger, nozzle, reservoir cap; dark blue pump. 2 2004 Twin Pack Equal Yellow body; light green reservoir; dark blue pump; orange nozzle, trigger, reservoir cap. 3 2004 Twin Pack Equal Light green body; yellow reservoir; dark blue pump; orange nozzle, trigger, reservoir cap. 4 2006 Rerelease Equal Red body; yellow reservoir and pump; blue trigger, nozzle, reservoir cap. 5 2006 Twin Pack Equal Light blue body; blue reservoir; green pump; orange nozzle, trigger, reservoir cap. 6 2006 Twin Pack Equal Dark blue body; blue reservoir; green pump; orange nozzle, trigger, reservoir cap. 7 Max-D 3000 Twin Pack with XP215 Equal Dark blue body; purple reservoir; silver pump; yellow detailing. 8 Max-D 3000 Twin Pack with XP215 Equal Light blue body; yellow reservoir; orange pump; silver detailing. 1 2002 Original Equal Red body; blue pump and detailing; yellow reservoir and reservoir cap; orange nozzle and trigger; upside-down L-shaped outcropping onto reservoir. 2 2003 Rerelease Equal Silver body; black pump and detailing; orange nozzle; yellow trigger and reservoir cap; green reservoir; upside-down L-shaped outcropping onto reservoir. 3 2004 Rerelease Equal Grey body; black pump and detailing; orange nozzle; yellow trigger and reservoir cap; green reservoir; O-shaped outcropping onto reservoir. 1 2002 Original Equal Orange body, trigger, nozzle; blue detailing and reservoir cap; green chamber and reservoir; upside-down L-shaped outcropping onto reservoir. 2 2004 Rerelease Equal Blue body; orange chamber and reservoir; green nozzle, trigger, reservoir cap; black pump, grip, and detailing; upside-down L-shaped outcropping onto reservoir. 3 2005 Rerelease Equal Grey body; black pump and detailing; red chamber and reservoir; orange nozzle; green trigger; yellow reservoir cap; O-shaped outcropping onto reservoir. 4 Twin Pack Equal Blue body; orange nozzle and trigger; green pump, chamber, reservoir; yellow grip, detailing, reservoir cap; upside-down L-shaped outcropping onto reservoir. 5 Twin Pack Equal Purple body; orange nozzle, trigger, chamber, reservoir; green pump, grip, detailing, reservoir cap; upside-down L-shaped outcropping onto reservoir. 0 Prototype Unreleased; non-functional; red, cylindrical pump; wooden; more information here. 1 2002 Original Equal Black body and pump handle; yellow reservoir and chambers; orange trigger, nozzle selector, detailing on grip; differently colored internals. 2 Equal Black body; yellow pump handle, reservoir, chambers; orange trigger and nozzle selector; red detailing on grip. 3 Dual Pack Equal Flattened and widened nozzle selector. 4 2005 Twin Pack Equal Red body; black pump; orange reservoir and chambers; yellow trigger, nozzle selector, reservoir cap. 5 2005 Twin Pack Equal Blue body; black pump; light green reservoir and chambers; yellow trigger, nozzle selector, reservoir cap. 1 2003 Original Equal Grey body; red reservoir and chamber. 2 2003 Original Equal Grey body; blue reservoir and chamber. 1 1999 Original Equal Biege body; dark red pump and grip; green reservoir. 2 2000 Rerelease Equal Yellow body; orange pump; blue grip and reservoir. 1 1999 Original Inferior Biege body; pink reservoir and chamber; marked "Air Pressure." 2 1999 Improved Superior Biege body; purple reservoir and chamber; marked "Constant Pressure." 3 European Superior Purple body; green reservoir and chamber. 1 1999 Original Inferior Biege body; orange reservoir and chamber; black pump and grip. 2 1999 Improved Superior Biege body; orange reservoir and chamber; grey pump and grip. 3 European Superior Blue body; orange reservoir and chamber. 0 Prototype Non-functional; unreleased; biege gun; red detailing on gun; red nozzle selector. 1 1999 Original Biege gun and backpack; green detailing on gun; orange nozzle selector. 2 European Light green gun; purple backpack; light blue detailing on gun; purple nozzle selector. Top left, SC PowerPak prototype; top right, SC PowerPak mark 2, European release; bottom, SC PowerPak mark 1, North American release. 1 2004 Original Equal Blue and white body; green pump, nozzle, reservoir cap. 2 2006 Max-Infusion Equal Blue and green body; green pump and nozzle; orange reservoir cap. 3 2006 Spider-Man Equal Red and blue body; red pump and reservoir cap; orange nozzle; white spider web detailing. 1 2004 Original Equal Rarer than other original; grey and green body; green pump and reservoir; orange nozzle, sight, and reservoir cap. 2 2004 Original Equal Rarer than other original; light blue, dark blue, and green body; light blue pump; blue reservoir; orange nozzle, sight, and reservoir cap. 3 Rerelease Equal Yellow and green body; green reservoir; blue pump and reservoir cap; orange nozzle. 1 2005 Original Equal Orange nozzle, trigger, pump detailing. 2 2006 Rerelease Equal Light green nozzle, trigger, pump detailing. 1 2005 Original Equal White body; blue chamber, detailing, reservoirs; green nozzle and trigger. 2 2006 Pack with XP 215 Equal Came with 50 ounce Aquapack; white body; teal pump and reservoirs; purple chamber and detailing; orange nozzle and trigger. 1 2005 Original Equal Red body and pump; blue reservoir; orange nozzle, trigger, reservoir cap. 2 Rerelease Equal Blue body and pump; light blue reservoir; orange nozzle, trigger, reservoir cap. 2 2005 Expanded nozzles; fan blast. 1 2007 Original Orange pump, nozzle, trigger, detailing; reservoir cap on bottom. 2 2008 Rerelease Yellow pump, nozzle, trigger, detailing; reservoir cap on top.